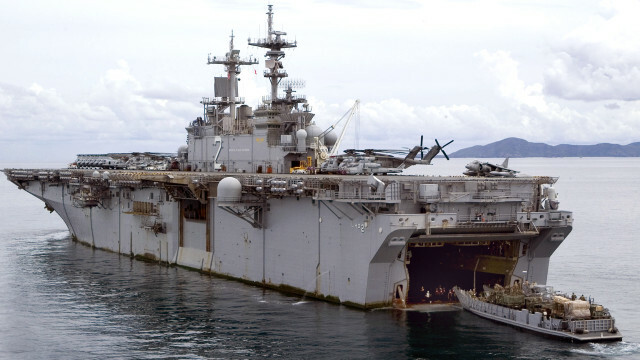 The USS Essex. Courtesy of Wikipedia. The ships, sailors and Marines of the Essex Amphibious Ready Group and 15th Marine Expeditionary Unit will depart San Diego Monday for deployment, the Navy announced Friday. The group is composed of the amphibious assault ship USS Essex, the amphibious dock landing ship USS Rushmore and the amphibious transport dock USS Anchorage, which is embarking upon its maiden deployment. After leaving, the 4,500 sailors and Marines will take part in a U.S. Pacific Fleet training exercise near Hawaii, and then head off for regular operations, according to the Navy. The Essex, named after a county in Massachusetts, is deploying for the first time since it was transferred three years ago to San Diego from its former base in Japan.